Behind the Scenes at the US Capitol Subway System in Washington D.C.
On a recent visit to Washington D.C., we had the opportunity to extensively check out the United States Capitol Subway System, one of the most unique in the world. The exclusive transit system is not exactly open to the public unless you’re a member of Congress or a staffer on Capitol Hill. It’s also one of the world’s shortest – the portion between the Senate to the Russell Senate Office Building is about 1000 feet and takes less than a minute. Riding US Capitol Subway system is mundane operating procedure for Capitol Hill employees, but a fascinating find for the lay people. Studebaker coach car running on Capitol Hill subway line. Photo from Architect of the Capitol via Wikimedia Commons. 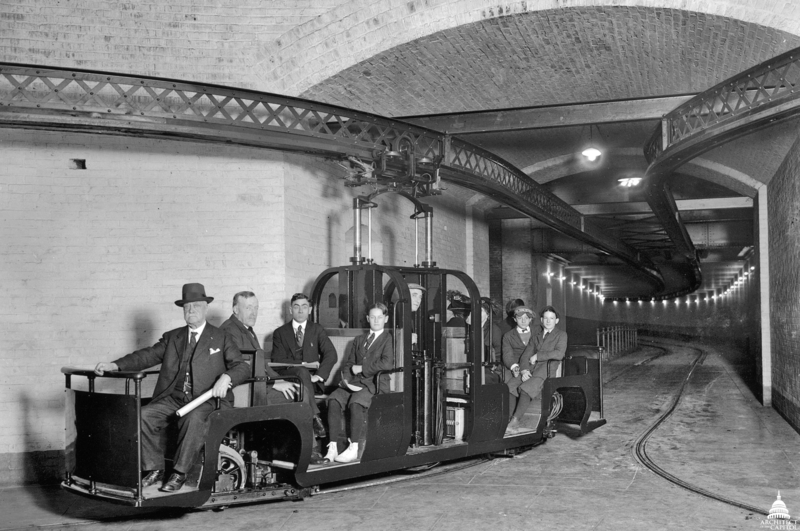 The first “trains” on the Russell Subway line, connecting the Capitol Building to the Russell Senate Office building launched in 1901 and were actually battery-powered Studebaker cars with a capacity of ten passengers at at time. They ran at 12 miles per hour and would run backwards for the return trip. In 1912, tracks were installed for a double-line electric monorail system, with wicker-seat trains carrying up to 18 passengers at at time. The trips on this system took 45 seconds. An original monorail car that operated from 1915 to 1961 is on display in the basement atrium of the Russell Senate Office Building, just before the entrance to the subway. Two of these monorail cars were built in the Washington Navy Yard, the first in 1915 and the second in 1920. Today, the subway system continues to enable Congressmen and women to save some time en route to votes (a no-show to a vote is recorded). The train that operates between the Senate and the Russell Senate Office Building is a quaint open air tram that runs along three catenary wires on the ceiling. There are four compartments for riders and a conductor cab in the center. Each compartment is furnished with padded red vinyl seating, and two compartments have seats facing each other. The United States Senate seal is emblazoned on the side of the car. Terminus on the Russell Senate Office Building side. One major change from the 20th century system is the path which the Russell subway line takes. When the system was extended to the Dirksen Senate Office Building, a new tunnel and rail system was built so that both lines could begin from the same place underneath the Senate. The original tunnel was filled in, converted to office and storage space. The subway line to Dirksen, featuring automated enclosed monorails with three cars each, also extends further to the Hart Senate Office Building. On the House of Representatives side, a similar subway system connects the basement of the Rayburn House Office Building to the basement of U.S. Capitol Building, although press photography is less encouraged there. Like the Dirksen Hart subway line, the subway tunnel contains flags and seals from the 50 states. In addition, a walkway known as the Cannon Tunnel connects the Cannon House Office Building with the U.S. Capitol and while there is no subway here, it has an interesting, but unverified history, an anonymous reader has told us: “It was supposedly to be a subway (the raised walkway with the railing was to be the walkway), but the two cars scraped each other during their trial run and were abandoned.” Today, the walkway showcases the high school artwork of the annual Congressional Art Competition, which has recognized and encouraged artistic talent in the nation and in each congressional district since 1982. The underground beneath Washington D.C. is full of history, unexpected turns and former systems, of which the United States Capitol Subway system is just one of many discoveries. Next, check out the original Commissioners’ Map for the New York City street grid, located in the Library of Congress and discover the secrets of the NYC subway system. Get in touch with the author @untappedmich. This is very interesting. I wish I could visit it. I’m curious: how did you manage to visit the Capitol Subway system? We knew someone who worked in the Capitol (and also applied for press access). Thanks for reading! now, juxtapose those pix of that clean, well maintained, subway, with NYC subway. and you get the real picture of what the USA, really is all about.